Fishing Trip types and when they are around. Striped Bass. 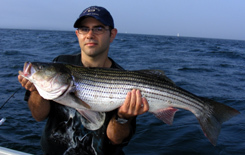 Stripers are great fish to catch. They usually show up sometime in the second week of May and are around until at least the end of October. 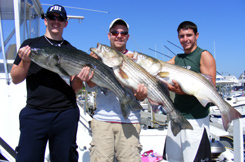 We fish for them that whole time, and the majority of our trips are striper/bluefish trips. Bluefish. Bluefish are nasty rugged fighters that pound for pound fight better than a bass of the same size. They show up sometime in June and hang around normally until sometime in October. They prefer warmer water than stripers. Flounder. Flounder are flat fish with both eyes on the same side and are bottom feeders. We can fish for these starting in June and they are around until sometime in September. They go into deeper water as the season progresses. Tuna. Bontio and False Albacore are the primary tunas we target and they don’t usually show up until sometime in July when the water has warmed up pretty well. They hang around until sometime in September to December, depending upo the weather. We target them for specific trips only from July to September. Tautog. The ugliest looking bottom fish we target, they are also the most tenacious fighters. These fish are around from May to December but we don’t target them on our trips until sometime in October when the catch regulations change. 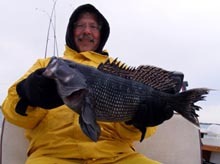 Most tautog trips occur between October 18 and November 12.